Sharon Cohen’s story features parallel narratives that eventually come together in an apocalyptic event on the Yorkshire moors. One strand is the story of Ageze, an Ethiopian boy who excavates three mysterious discs, associated metal pointers and a brass key from the sand near an ancient church. The discs are covered in symbols that Ageze learns to read with the help of an old scholar. When the discs and the pointers are assembled into a single unit, and the key is turned, Ageze discovers the instrument (the Portendo device) has the uncanny ability to foresee impending disasters, like a nearby burst water main and factory fire. 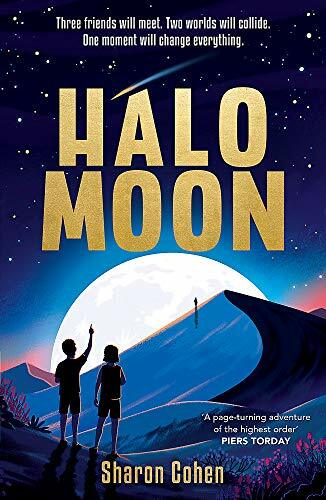 Meanwhile, in a small Yorkshire village, the strikingly named Halo Moon is making a friend of Pedro Ortega, the new boy across the road, and together they study the stars at night and go for daytime walks on the moors. Back in Ethiopia, Ageze’s device reveals that the next catastrophe is due to happen in Yorkshire. It’s further away than usual, but he determines to make the long journey to warn those who are in the path of destruction. Arriving in Pockley, worse for wear from the journey, and befriended by Halo and Pedro, he then has to convince everyone to take him seriously. He does, and the village is evacuated, but then the children somehow find themselves in the very eye of the storm. A preface bravely declares that, while such a story might be unbelievable and impossible, it did all happen. I doubt whether any reader will believe that for a minute, but Cohen tells her story in the right spare urgent prose and, like buried treasure, a secret cave behind a waterfall, and the ability to see the future, it’s a fiction that children might find seductive.